The St Francis Hospice began in a very small way with the odd cat who was too old or infirm to be re-homed, being fostered by Shirley and Michael Maynard in their own home for whatever time remained to them. Then, as the number of elderly cats, and cats with chronic or even terminal medical conditions grew, the Maynard’s made the decision to turn their home into a hospice catering exclusively to the special needs of these cats. 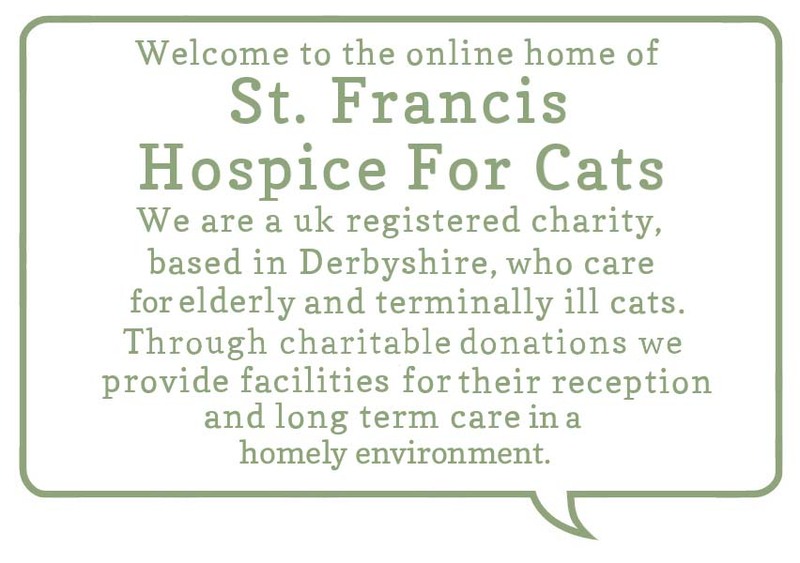 In April of 1997 St Francis Hospice became a registered charity and over the years, with the aid of donations, it has helped many, many cats to live long and happy lives. Currently the charity is administered by four Trustee’s, including Shirley, each of whom take time from their own busy day to day routines to help care for these cats in the calm and friendly environment of The Saint Francis home. Regular visits by Dr. Abdul Rehman, the charities veterinary surgeon, ensure that the cats receive all the medical treatment necessary to sustain the quality of their remaining years. This regular treatment combined with the love, comfort and constant day to day care that the charity and it's trustees are able to give to the cats has resulted in many of them living far beyond first expectations. However, the Hospice cannot function on the good will of the trustees and it's group of volunteers alone. Caring for these cats is a major undertaking and it is only through donations that the work of the charity can continue. St. Francis Hospice will always need help towards the cost of maintaining the care of these cats. Please consider helping us by making a donation. Every penny helps, no matter how small. We gladly accept one off donations or you can set up a standing order to make a regular payment directly to the charity. All funds are administered by Trustees. Every penny is needed, appreciated and never wasted. We are always happy to answer any questions that you might have about the hospice. If you wish to make an enquiry about donating or subscribing to the newsletter or anything else, you may use the contact form on the right. Please provide your name and e-mail address so that we may get back to you. The Hospice may also be contacted on this telephone number 01283 762179 . If no one is available to take your call please leave a message and one of the trustees will get back to you as soon as they are able. We also post updates on Twitter at @sfhforcats and we are now on Facebook HERE and on Instagram here.